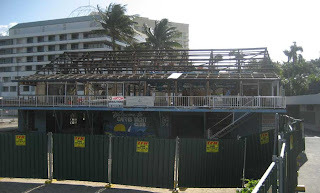 As the walls and roof come tumbling down on the historic Cairns Yacht Club, John Mickel, the irresponsible Minister responsible for this environmental vandalism, finally responds. 11,000 Cairns and Queensland residents asked the Queensland Government to keep their favourite waterfront watering hole. Here's the Minister's official response. Desley Boyle sold out the people of Cairns. As a long term supporter I feel cheated by her and other the other local party hacks' inaction from what is supposed to be the Labor Party in this state (more like National Party Lite). She will not receive my vote in the upcoming election. Cairns has lost so much of its character because of the indifference of our local MP's and this state government. I wonder if they have put the East Trinity wetlands on the market yet? I think all 4 local members, but especially the non-member for Cairns, deserve to be voted out at the next election for their refusal to represent the people of Cairns on the Yacht Club issue. 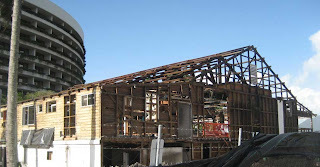 What they do not seem to realise is that the people who are angriest about this are the very people who have always supported them.John Mickel's reponse does not contain anything new and does not explain how the people of Cairns will benefit from replacing a heritage building with a high-rise. If only they had the guts to say it : "we need the cash and that's why we did it !" Missing the golden opportunity to do something worthwhile with this area will be the Bligh's government's legacy here in Cairns. The late Russ Hinze, minister for everything, would be proud of this government and its utter contempt for the wishes of the people. In a few months time all sort of promises will be made as they beg to keep their jobs. Don't be swayed ; show them the door for what they have done to this city !! I think we should organise a daily, silent protest every day at lunchtime outside the Yacht Club, while the demolition is in progress. And of course we should make our presence felt at the sitting of parliament in Cairns in 2 weeks time. Off with their heads I say.. The Queen, Her Governor-General and State Governors (The Crown) are directly responsible to the people in the respective electorates. Ministers are Ministers of the Crown, they may be removed by the Crown. It is within the power of the Crown to give the people the specific results that they want from the Parliamentary machine. Ergo, If 11,000 people petitioned the State Governor to remove a Minister or Ministers because they had ignored the WILL of the people, then the Governor must act on that request. Yes, it's about time that elected representatives, whether at a Federal, State or Local Government level really start to pay attention to those who elected them in, & always to remember that our taxes & rates pay their extremely generous wages & subsequent superannuation & perks. I think a large part of the current Australian lacklustre politics is due to elected representatives having to vote along the Party line - so we get the situation as happened with the Yacht Club - Boyle, Wettenhall, Pitt & O'Brien all having to toe the party line, so no weight was given to the wishes of more than 11,000 people. Ergo the Mary River Dam, ergo fluoridation of Queensland's water. ergo Beattie pushing through Council amalgamations based on Brisbane bureaucrats decisions, with no possibility of community consultation. Ergo Peter Garrett's namby-pamby stance on the Gunn Papermill in Tasmania. There are numerous examples. What's next, re-education camps for those objecting? Sounds far-fetched, but unless we citizens put our teeth back in & start nipping at the heels of these elected representatives, & the pale bureaucrats that make & support these awful decisions, I believe that democracy in Australia, could, in the long-term slide into chaos. I realise that political activism has not been a strong part of Australian lifestyle, but I think it's time to raise up from that lethargy and to really take a hand in influencing politics. However, we have had Eureka and the 40-hour week, so activism is not totally alien to us. Yes, it's hard & exhausting to fight all the time, & sometimes we all need a little break, but it's necessary. I for one will not be voting for any Party member in the next elections at any level - I'll be looking for strong, sane independents who will truly try & represent our interests. In the Constitutuion of Alcoholics Anonymous, the issue of representation is addressed thus: "Our leaders are but trusted servants. They do not govern." I wish our elected representatives would act accordingly.